RUTENG, Indonesia (CNS) — The Vatican has asked Indonesian Bishop Hubertus Leteng, who recently resigned over allegations of theft and having an affair, to return the church funds he is accused of stealing. The request over the missing money was not mentioned in an Oct. 11 announcement by Vatican of the resignation. 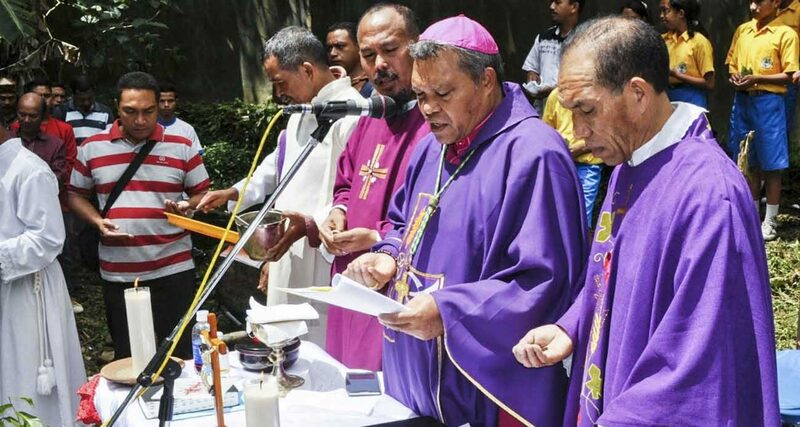 However, Father Robert Pelita, who participated in a meeting between officials of the Vatican, Indonesian bishops’ conference and Ruteng Diocese, told ucanews.com the request was made directly to Bishop Leteng. “The Vatican representative said that, in principle, the money must be returned,” Father Pelita told ucanews.com Oct. 13, although the Vatican did not say when the bishop should pay it back. Pope Francis approved the resignation of the 58-year-old bishop following the investigation into allegations that he secretly borrowed $94,000 from the Indonesian bishops’ conference and $30,000 from the diocese, without providing an accountability report. In a meeting with the priests in the diocese, Bishop Leteng said the money was being used to fund the education of a poor youth in the United States, but he failed to provide further details. In protest against Bishop Leteng’s actions, 68 priests in the diocese resigned as episcopal vicars and parish priests. They suspected the missing money went to a woman with whom they allege the bishop was having an affair. Bishop Leteng did not respond to a request to comment publicly on repayment of the missing money. However, a diocesan official, who spoke on condition of anonymity, said that at a recent meeting Bishop Leteng promised to return the funds. Since the case went public, he has repaid 75 million rupiah (US$5,555) of the money he took from the diocese, the source said. Bishop Leteng has said he will gradually repay money owed to the Indonesian bishops’ conference. Officials at the Indonesian bishops’ conference refused to comment, saying that the case is under the Vatican’s authority. Bishop Leteng is still in Ruteng, but Father Agustinus Manfred Habur, the bishop’s secretary, said that on Oct. 11 the Vatican gave him 10 days to leave the diocese. “However, where he will move is the secret of the Vatican,” he said.